This web site presents skin cancer treatment and prevention information to enable natural healing of squamous or basal cell carcinoma. Practical strategies for skin cancer prevention and treatment based on enhancing the body's natural defenses are provided, including descriptions of topical home remedies. With over a million new cases of basal cell and squamous cell carcinoma now expected in the US each year, the results of promoting sun safety measures alone to prevent skin cancers have been less than successful. This complementary folk medicine approach identifies several important underlying causes of squamous or basal cell carcinoma beyond excessive sun exposure. Targeting the causes and mechanisms of skin cancer can lead to its control through changes in lifestyle, diet, cosmetics, and nutritional supplements. Contemporary skin cancer prevention advice focuses on stopping cell damage from ultraviolet radiation by minimizing sun exposure and liberally applying sunscreens. Yet for many people, following this advice may not be effective. Sun avoidance does not address existing damage to skin cells and can lead to deficiencies of vitamin D that is vital for the immune system to fight diseases that include skin cancer. Typical sunscreens prevent vitamin D synthesis, still allow cell damage, and have hormonal properties that may promote cancer growth. Although sunscreens do protect against sunburn, they have not been proven to prevent melanoma or basal cell carcinoma in humans. The incidence of melanoma has increased 690 percent from 1950 to 2001 in the US. Basal and squamous cell skin cancer statistics are more difficult to obtain because they are not required to be reported to cancer registries, but show a similar doubling trend for about every twenty years. 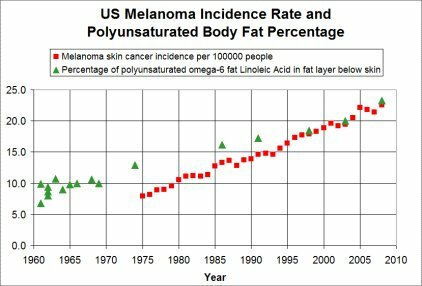 These huge increases continue to occur despite the introduction and widespread use of sunscreens. However, there is evidence that sunscreen use can reduce the formation of actinic keratoses, the precursors of squamous cell carcinoma. If sun safety measures are at best inadequate to prevent skin cancer, what else can be done? 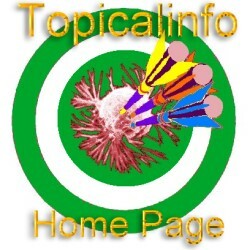 This web site explores several alternatives such as identifying nutritional causes and optimizing the immune system against skin cancer. For example, excessive polyunsaturated vegetable oils in the diet can increase the risk of skin cancers because they promote inflammation, generate too much of one class of hormones, impair immune system function, and become easily damaged by ultraviolet radiation when incorporated into skin cell structures. Polyunsaturated oils also decrease vitamin D bioavailability. Rising skin cancer rates are likely the result of many factors including sun exposure combined with other factors such as inflammation promoting diets and vitamin D deficiencies. Picture of a typical basal cell cancer lesion. The immune system, when it is functioning correctly, uses pancreatin enzymes to help destroy cancers that occur in the body. Strategies to fight skin cancer by tuning up this and other natural defense mechanisms are explored. Three factors are necessary for cancers to exist. The most familiar of these factors is cell damage, often caused by exposure to ultraviolet light from the sun or tanning booths in the case of skin cancer. The other two identified necessary factors, the presence of certain hormones and a compromised immune system, provide us with very fruitful ways to treat and prevent cancers that are less widely recognized and explored. Skin cancer does not have to be inevitable or unstoppable despite prior cell damage. Although most people know something about the body's defense mechanisms for fighting bacterial or viral infections, generally little is known about how the body naturally fights cancers that occur. Modern cancer theory has not been very helpful in this needed understanding because it mostly overlooks two prominent natural cancer defense mechanisms: enzymes excreted by the pancreas and special white blood cells known as natural killer cells. Modern theory also does not clearly define the role that hormones play. A cancer theory that prominently incorporates the pancreatin enzyme defense mechanism and defines the role of hormones was first proposed by a Scottish embryologist about a century ago. Pancreatic enzymes have two important functions in the body: digestion of foods and routine cancer eradication. Pancreatin is a mix of many different enzymes, and those involved in the digestion of proteins are also used to help eliminate cancers that occur by dissolving the protein coating which protects cancer cells from being recognized by the immune system. Cancer is often a disease of protein metabolism because the pancreatin enzyme cancer defense mechanism can be overwhelmed by consuming protein rich foods at inappropriate times or in excessive amounts. The body needs a time span each day approaching twelve hours or more without protein consumption for its pancreatin cancer defense mechanism to work optimally. Vitamin D is involved in the maintenance of normal pancreatic function and insulin sensitivity. It is possible to enhance the function of the immune system to heal existing skin cancers! Looking beyond excessive sun exposure as the sole cause of skin cancer, many factors have been identified that can impact the course of the disease. Usually these factors are the result of scientific studies but are not placed in a comprehensive context so the big skin cancer picture is missed. This web site starts by examining established cancer risk factors and ties most of them together in an overview of the real causes of skin cancer. Dozens of practical skin cancer treatment and prevention strategies are then outlined. The information on this web site is presented with the best intentions but use it at your own risk. There is nothing for sale here and most of the strategies are either free or inexpensive to try. These include skin cancer topical home remedies using ingredients available at your supermarket. Also be sure to investigate and participate in the skin cancer forums. These forums chronicle the experiences of people trying skin cancer home remedies as well as leading edge conventional treatments. How healthy is your cancer immune system? Take the acid test! This information is intended to heighten awareness of potential health care alternatives and should not be considered as medical advice. See your qualified health-care professional for medical attention, advice, diagnosis, and treatments. © Copyright 2012 Topicalinfo All rights reserved.